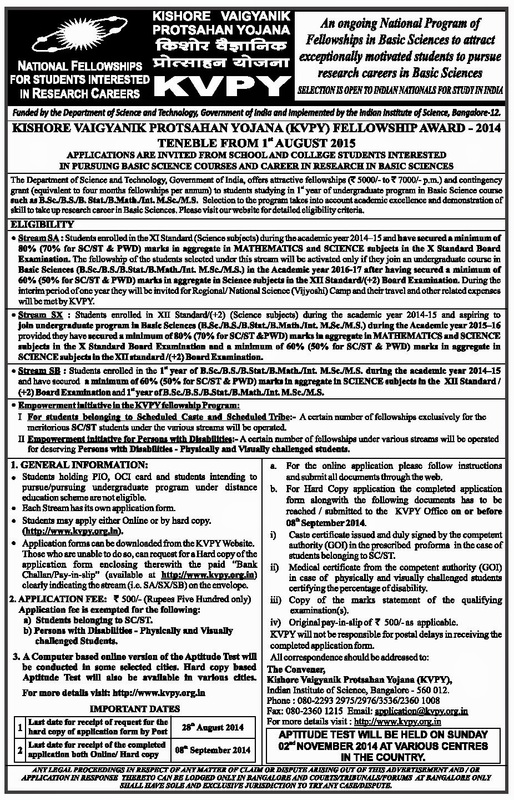 The Kishore Vaigyanik Protsahan Yojana (KVPY) is an on-going National Program of Fellowships in Basic Sciences, initiated and funded by the Department of Science and Technology, Government of India, to attract exceptionally and highly motivated students for pursuing basic science courses and research career in science. The selection of students is made from those studying in XI standard to 1st year in any undergraduate Program in Basic Sciences namely B.Sc./B.S./B.Stat./B.Math./Int. M.Sc./M.S. in Mathematics, Physics, Chemistry and Biology having aptitude for scientific research. Special groups / committees are set up at IISc, to screen the applications and conduct an aptitude test at various centres in the country. Based on the performance in the aptitude test, short-listed students are called for an interview which is the final stage of the selection procedure. For receiving a fellowship, both aptitude test and interview marks are considered. The "Kishore VaigyanikProtsahanYojana" (KVPY) is a program started in 1999 by the Department of Science and Technology (DST), Government of India to encourage students of Basic Sciences to take up research careers in Science. The aim of the program is to identify and encourage talented and motivated students to pursue career in research. This program aims to assist the students to realise their potential and to ensure that the best scientific talent is groomed for research and development in the country. Generous fellowship and contingency grant are provided up to the pre-Ph.D. level to the selected KVPY Fellows. In addition, summer camps for the KVPY Fellows are organized in prestigious research and educational institutions in the country. Generous scholarships are provided up to the pre-Ph.D. level to the selected KVPY Fellows. The KVPY Fellowships are given only to Indian Nationals to Study in India(OCI and PIO’s are not eligible). Students enrolled in an undergraduate course in Basic Sciences, that is, B.Sc./B.S./B.Stat./B.Math./Int. M.Sc./M.S. in Chemistry, Physics, Mathematics, Statistics, Biochemistry, Microbiology, Cell Biology, Ecology, Molecular Biology, Botany, Zoology, Physiology, Biotechnology, Neurosciences, Bioinformatics, Marine Biology, Geology, Human Biology, Genetics, Biomedical Sciences, Applied Physics, Geophysics, Materials Science or Environmental Science. Stream SA: Students enrolled in XI Standard (Science Subjects) during the academic year 2013-14 and having secured a minimum of 80% (70% for SC/ST/PWD) marks in aggregate in MATHEMATICS and SCIENCE subjects in the X Standard Board examination. The students under this stream will be mentored for one year. Their fellowship will be activated when they enrol in an undergraduate course in Basic Sciences (B.Sc./B.S./B.Stat./B.Math./Int. M.Sc./M.S.) after XII Standard(+2) securing a minimum of 60% (50%for SC/ST/PWD) mark or equivalent grade. During the mentoring period of one year, they will be invited for Regional Science Camp/National Science Camp and expenses for attending those camps will be met by KVPY. Stream SX: Students enrolled in XII Standard/ (+2) (Science subjects) during the academic year 2013–14 and aspiring to join an undergraduate program in Basic Sciences namely Physics/Chemistry/Mathematics & Biology leading to B.Sc./B.S./B.Stat./B.Math./Int. M.Sc./M.S. for the session 2014–15 provided they have secured a minimum of 80% (70% for SC/ST/PWD) marks in aggregate in MATHEMATICS and SCIENCE subjects (Physics/Chemistry/Biology) in the X Standard Board Examination. They must secure 60% (50% for SC/ST/PWD) marks in aggregate in MATHEMATICS and SCIENCE subjects (Physics/Chemistry/Biology) in the XII standard Board Examination before taking up the fellowship, if awarded. Students in their 2nd year of study in Cambridge International Examination Board and aspiring to join an UG program (viz. B.Sc./B.S./B.Stat./B.Math./Int. M.Sc./M.S. )in Basic Sciences namely Physics, Chemistry, Mathematics and Biology in the Academic year 2014-2015 are eligible to apply provided they have secured a minimum of 80% (70% for SC/ST/PWD) marks in aggregate in MATHEMATICS and SCIENCE subjects (Physics/Chemistry/Biology) in the X Standard Board Examination. They must secure 60% (50% for SC/ST/PWD) marks in aggregate in MATHEMATICS and SCIENCE subjects (Physics/Chemistry/Biology) in the XII standard Board Examination before taking up the fellowship, if awarded. Stream SB: Students enrolled in the 1st year of undergraduate program in Basic Sciences namely Physics/Chemistry/Mathematics & Biology leading to B.Sc./B.S./B.Stat./B.Math./Int. M.Sc./M.S. during the academic year 2013–14 and having secured a minimum of 60% (50% for SC/ST/PWD) marks in aggregate in SCIENCE subjects (Physics/Chemistry/Biology/Mathematics) in the XII Standard Board Examination. In the 1st year final examination of B.Sc./B.S./B.Math./B.Stat./Int. M.Sc./M.S. they must secure 60%(50% for SC/ST/PWD) marks before taking up the fellowship, if awarded. A certain number of additional fellowships exclusively for the students belonging to SC/ST community under the various streams as stated above will be operated. A special orientation program for the selected SC/ST students will be organized. Aptitude Test: After scrutiny of application forms and meeting the eligibility criteria for various streams, all eligible students will be called for a written aptitude test conducted both in Hindi and English at different centers across the country on Sunday, the 27th October 2013. The details of the venue of the aptitude test for the eligible students and their seat number will be published in the KVPY website during the first week of October 2013. Students who have applied online may download the admit card for the aptitude test from the website from the second week of October 2013. Interview: Based on the performance in the aptitude test, short-listed students will be asked to appear for an interview which is the final stage of the selection procedure.